It's grey, grey, grey out there; I need some colour in my life! The October block is one I've never done before and have admired from afar, economy blocks. They were all done from scraps, no fabric lengths were injured in their making. I had fun with every one, although sewing world looks like a bomb went off in there! I'm hard pressed to choose my favourite in this group of four. I guess the pink ears on the cats still gets me every time. No contest in this group, the border collies and the high heels. I bought that fabric to make my mother some throw pillows years ago. She was always a high heel kind of gal! This next grouping makes me wish I had a better camera, but like everything else, an expensive camera doesn't guarantee wonderful photos any more than an expensive sewing machine guarantees perfect points! I have to say, this one was the favourite. Bunnies and polka dots are an unbeatable combination. I also decided to hop onto the Farmer's Wife Quiltalong. I'm late to the party, but decided that until I get more babies to sew for (soon, I'm sure) then it's best to work on small, slow projects. There's only so many quilts I can lounge under, even if it's really peak lounging weather. So, today I made three blocks, in no particular order. The first was #12, Becky. It was very easy to sew once you cut out all the little pieces. I think this was just to lure you into the vortex because it looks like the easiest one in the book. I can't imagine making an entire quilt using this one block, but it could translate to a bright scrappy quilt. Next was #8, Aunt. My practice making economy blocks this months came in handy. I'm still using up bits of fabric, so there won't be a cohesive colour scheme, but I think it doesn't matter to me that much. I seem to have too many small pieces of material hanging over my head so I'm very happy to keep using them up. Sometimes scraps just make me anxious and guilty about buying anything new. Another simple block is Bonnie, #16. Although it was super easy, I like the look of it and can see it making very interesting repeating patterns in a quilt. Something to remember. So far everything is working out to be 6.5 inches, with a little trimming of the edges. 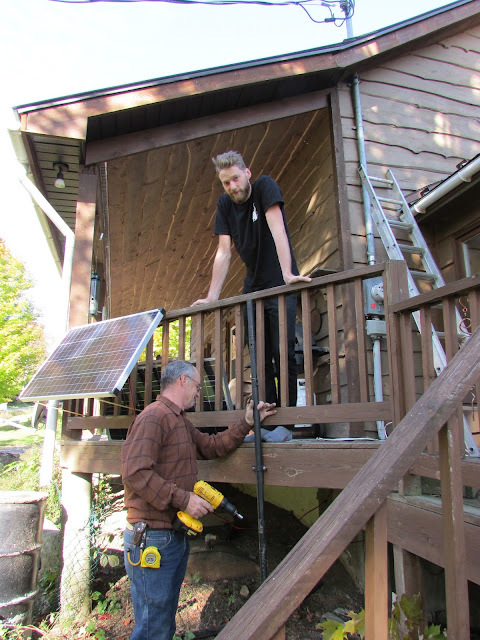 This month's outdoor project was installing a second solar panel on the porch. It used to be up on the roof, but it was always covered by snow and ice. There's no way I'm letting Neil onto a tin roof in mid winter to brush it off. With our son supervising, it went up quickly. And a little eye candy to remind us that there is beauty all around. I absolutely love those economy blocks- fussy cut centers are so much fun. The beatrix potter block is definitely my favorite. Love the economy blocks!! And have fun with the farmers wife blocks. They are very cute. You have found some splendid fabrics for the centres of your economy blocks. I love the little owl and Peter Rabbit the best but put altogether they will make a really fun quilt. I'm a sucker for conversation prints too! That's a great way to use up the scraps! Your Fall pix are beautiful! Love all those colorful blocks!! 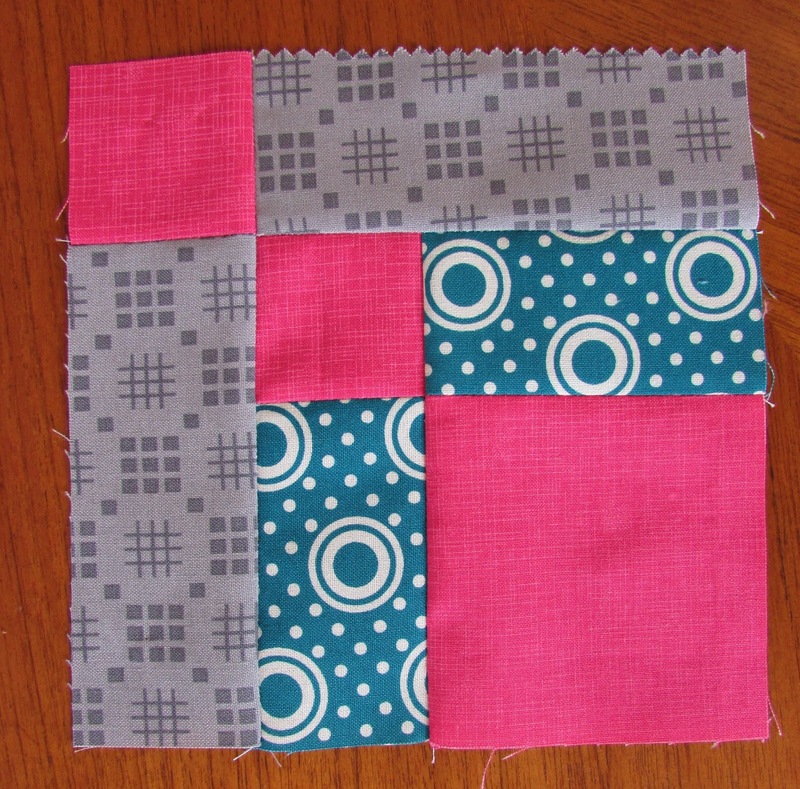 I really need to start using scraps and making those economy blocks!